Elon Musk’s Space X makes rockets and now his Tesla Motors Model X crossover can launch you and six passengers on adventures of your own. Landing in showrooms in late 2016, this all-electric SUV comes with front and rear motors providing standard awd and can travel up to 257 miles on a charge. Among its unique features are articulated “falcon wing” motorized side doors that hinge skyward to provide access to the second- and third-row seats while taking up less than 12 inches along the vehicle’s flanks. Essentially a heavier, taller-riding, wagon version of Tesla’s all-electric Model S luxury sedan, the Model X offers three grades of price, range, and performance. The entry-level 70D version is expected to list for $81,200, travel 220 miles on a charge, and do 0-60 mph in 6.0 seconds. There was no MPGe rating for the 70D in time for this report, but the 90D rates 92 MPGe with a 257-mile range. Tesla pegs it at 4.8 seconds 0-60 mph. It’ll be priced between the 70D and the top-line P90D, which is expected to start around $115,000. The P is for “performance,” meaning 762 horsepower and 713 pound-feet of torque and 0-60 in just 3.8 seconds (3.2 with the Ludicrous Speed-mode option). It’s rated 89 MPGe with a 250-mile range. 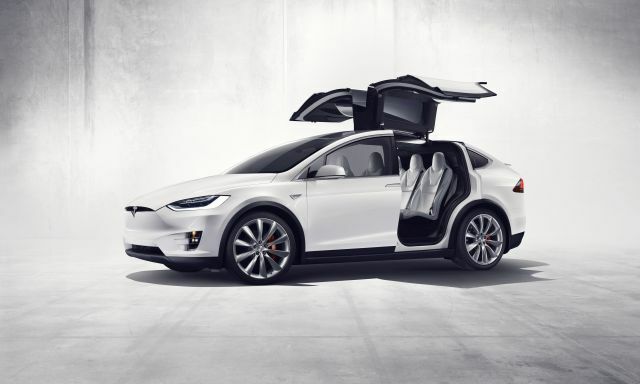 Like the Tesla sedan, the Model X combines astounding levels of speed and handling with a Silicon Valley aura of bold design and brainy thinking.